Gecko Omega TV stand offers something a bit different | What Hi-Fi? Its unusual design is apparently derived from the "iconic Omega shape" and blends an eye-catching support with practicality, says Gecko. 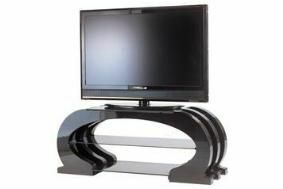 The heavy-duty curved legs are finished in gloss black and the shelves are made from toughened glass. A cable management system hides all your cables out of sight, and there's an optional bracket (MBM-1000) for mounting flatscreen TVs. Standanddeliver.com is currently offering the Gecko Omega on sale at £499. If you'd prefer something a tad more traditional, Gecko has six other AV furniture ranges to choose from: Reflect, Opal, Sapphire, Impro, Mount and Obsidian.